My training is as an Art Educator, but I have also written and illustrated 3 of my own children’s books, which you can find on my website: www.katrinamorse.com. 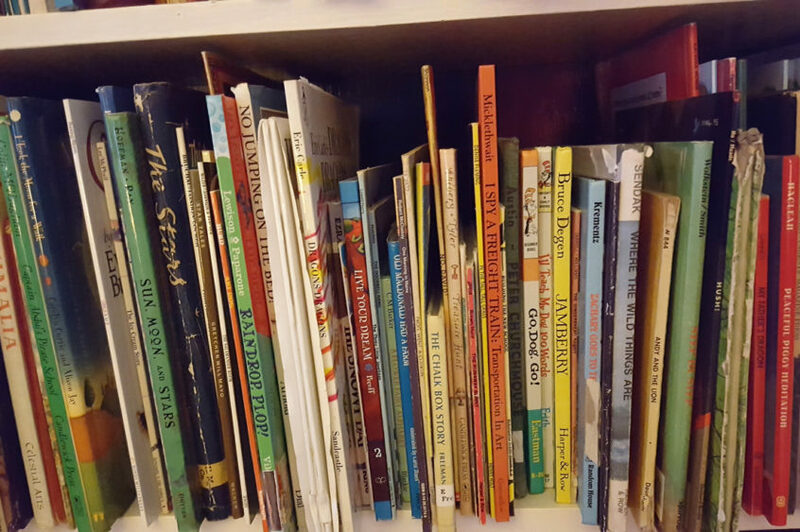 I worked for 16 years at a not-for-profit organization, Family Reading Partnership, that promotes reading to young children and I wrote articles about reading to children for multiple years in our local newspaper, the Ithaca Journal. All this is to say that I have a passion for sparking a child’s interest in the world, giving encouragement to adults to be nurturing to children, and fostering imagination and creativity in both children and adults. And all that can be found in children’s books! Let’s start out with children’s books for this time of year in the northeastern US. I am writing from Ithaca, NY, where it’s winter. Snow, cold, and occasional sun are the forecast for each day. I have heard that Ithaca may be one of the most overcast cities in the country, and in the winter, when THE CLOUD moves in and covers the sky for most every day it seems like that “honor” may be true. This is the perfect time of year to snuggle up and read with your young child! Cold outside, but warm and cozy on the couch with a stack of picture books to explore. What could be better?! “The Snowy Day” by Ezra Jack Keats. You can watch and listen to an animated read-aloud of this book by Napoleon Maddox for the Ezra Keats Foundation. Written in 1976, the story is timeless and lovely in so many ways. It describes winter and snow from a child’s point of view. Walking in the snow making tracks of all kinds, snow angels, snowmen, and sledding. What happens to snow when you bring it inside? After you read this book one time through with your young listener, go back and talk about the feelings of the main character Peter, about the sequence of time from putting a snowball in a pocket to finding out what happens to it later. STORY EXTENDER: Get your snow clothes on and do all the fun things Peter did outside–snow tracks, snow angels, snowballs, and sledding! If you don’t have snow but have sand nearby, you can still do a few of those activities! Send me your comments and photos! “The First Day of Winter,” by Denise Fleming, 2005. Here is inspiration to make a snowman or snow woman or snow creature in your own backyard. What will you use for eyes, nose, and mouth? Fleming’s illustrations are all created of hand-made paper. Beautiful and colorful! STORY EXTENDER: This story will give you ideas and inspire your family to make a snow family! Or create your favorite storybook character out of snow! “First Book of Nature” by Nicola Davies and Mark Hearld, 2014. From beach to mountains top, spring to winter, this romp through the seasons uses poetry, prose, activities, and inspiration to help experience and appreciate our natural world. A publication from England, it can be purchased in the US. STORY EXTENDERS: Try out a recipe for berry crumble, create a bird’s feast to share, or look at the stars from your backyard. It’s all described in the book!